Are you ready for the launch of Windows 7 on this Thursday? Microsoft is all set for the release of next generation of Windows Operating System. As 90% of world’s computers runs on Windows this is really great day for all the computer users. 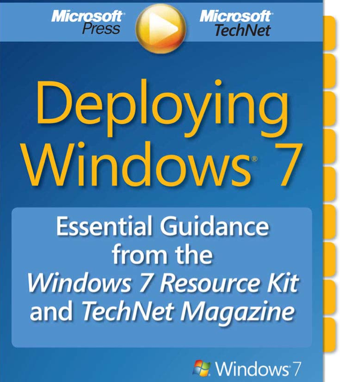 Microsoft Press released a free EBook Deploying Windows 7 Essential Guidance from the Windows 7 Resource Kit and TechNet Magazine (PDF Alert!!) . This book is good read for people who will be managing or for those who are simply looking to improve their IQ on Windows 7. This 322 pages free Ebook is a aimed for IT folks and it covers a wide range of Windows 7 topics like Deployment Platform, Planning Deployment, Testing Application Compatibility, Migrating User State Data , Deploying Applications, Preparing Windows PE, Configuring Windows Deployment Services, Using Volume Activation, etc.